Nemesis was quite enchanted by the sight of the semigod's vibrant red scales and shade of bright orange. Like colors of a sunset, which Nemesis liked watching sometimes. 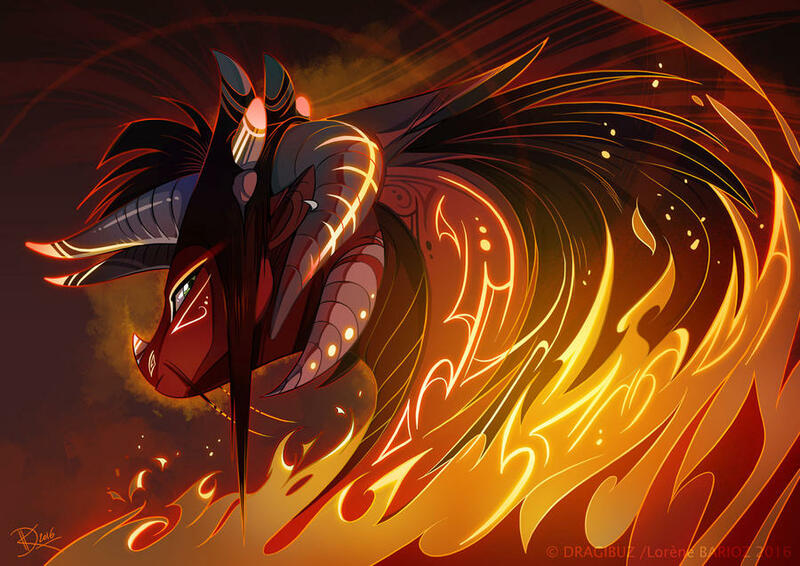 Most FireWings had slightly darker colors other than red, like Nemesis herself: her scales were only crimson, like a blood-red with fire flickering down her neck. Also, they both had a spout of fire on their tailtip. One thing they have in common. What did the male FireWing say his name was again? Oh, yeah. Flames. Nemesis forgot things often, so it was kind of face-paw worthy that a citizen of the Tribe forgot the name of one of the leaders. No matter. Flames had just finished a book, and Nemesis couldn't help but be curious. "What's.... it about..." she said softly. Hi! I'm Nemesis, alternate account of Rylatha, Alistair, Drac, Furutsu, Ruby, and Rektani Lozain of Earthil. I'm currently 14,my birthday being October 8th. I like Percy Jackson, Undertale, Skyrim, FNaF, and lots of other things! I have four brothers, and I'm the only sister out of them all. I've been at DRF for two years, and hopefully I can stay longer!I won't say I'm weird, because I have a pretty normal life. I am a bit of a fangirl, and I admit I can be clingy without realizing, but hey; shoot me a private message if you wanna chat! Flames blushed after her second compliment to his home (Also not a visible one XD) "Well I am the only one who lives here, so I can add whatever I desire and I wont have others to judge me..... Anyways, come in." He replied, walking inside his volcano, holding one of the doors open for her. He already enjoyed her company, as stated before, the only dragon that has been in his volcano that wasn't him, was Tempest and it had always only been tempest, until now. (Curse you, red scales! XD) Nemesis nodded in understanding, and stepped further in the den. She saw a few books on the shelves that she had read. A few caught her eye, but there was one... "O- Oh! I- I've read this one!!" She grinned excitedly and nodded at a book that had a dark green cover. "It's one of my favorites!" It was a cautionary tale for young dragons: fluffy bunny hops into the woods and gets eaten by a big nasty fox... A warning that dragons must always be aware of their surroundings. "It's my favorite because my parents read it to me as a child...." Nemesis blushed, slightly embarrassed. Flames followed her, shutting the door behind him. He watched her carefully as she looked around the room, only because it was his home and the last thing he needed was a mess or disaster to happen. To Flames' surprise, he saw Nemesis eye out one of the books on one of his book shelves. He got a bit nervous, as the only reason he had a children's book like that, was just in case he had hatchlings of his own one day, he was almost prepared for everything in his future life. He didn't want to tell her that, as it would be quite awkward and maybe even rude if he told a female that he had that book for future hatchlings of his own, but that's only what he thought. "Oh cool, I only have it because... Well I found it in the woods and didn't know where to put it, so I decided to just keep it until someone wanted it." He lied, speaking in a nervous tone. Nemesis smiled calmly. She was no longer jumpy or skittish. She was happy, even, and that showed itself in her eyes and the way she smiled. For Nem to be really happy for once in a while was quite a sight. It was pretty rare too, but one may think it was completely normal once she got to know someone. It would usually take her longer to warm up to others, but there was something about Flames that made her relaxed. Perhaps it was because he was so relatable to? So similar to Nemesis herself? No matter the reason, the female FireWing wasn't worrying about that now. Her attention was solely on the semigod Flames, whom she was excited to spend time with and learn more about. She thought he was cute too. She wasn't aware of that at the moment though. "How thoughtful of you," she said, smiling still. "Every book is valuable.. T- To me." He smiled warmly at her as she replied, but on the inside he was very nervous. Once again, her presence reminded him of when Nisha was here, and it reminded him how a lot of dragons were confused how he, the semi god was mate less. It bugged him a bit and out of all his biggest thoughts, mates were one of them, knowing that he was getting older and should start getting into relationships. He felt weird thinking about this, Nemesis looked rather cute and lovely to him, making him nervous on the inside every time he looked at her, he was doing great at not showing that on the outside though. Flames thought for a moment before responding back to her. "Right.... So, is there any sort of thing you want to do? like a game or something?" He asked in a calming manner, but on the inside he wasn't sure if what he asked was good. Nemesis kept grinning at Flames. It was odd, for this timid FireWing to suddenly be so outgoing and maybe even a tad excited. Flames' presence was just that comforting, and Nemesis was pretty used to it by now. He's kind of cute, too. She was surprised at her own thought. Cute? She hadn't ever called a dragon 'cute' before. If she had she wasn't conscious of it, and it kind of unsettled her at first. Cute...? Mating wasn't on Nem's mind often. She'd think about it when dragons mistake her brother as her mate, but never really focused on it. I'll just... G- Go with the flow. See what happens. "Yea, a game sounds fun," Nemesis said, smiling, even though her grin looked like a nervous one. "What'cha got...?" Flames nodded at her reply, glad that she wanted to play a game with her. He also wanted to find a way to get to know her more, so he kept thinking of a game that would allow him to do that. "How does truth or dare sound?" Flames asked, on the inside he was nervous, knowing that truth or dare questions and dares tend to lean into awkward stuff, but he still needed to find something fun to do, instead of just talking about conflict and things he always talks about.